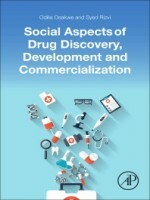 Social Aspects of Drug Discovery, Development and Commercialization provides an insightful analysis of the drug discovery and development landscape as it relates to society. This book examines the scientific, legal, philosophical, economic, political, ethical and cultural factors that contribute to drug development. The pharmaceutical industry is under scrutiny to develop safer and more effective drugs in a quicker and more affordable manner. Recent criticism and debates have emphasized varying opinions on the issues concerning the drug discovery and development process. This book provides thoughtful and valuable discussions and analysis of the social challenges and potential opportunities through all stages of the pharmaceutical process, from inception through marketing. With a unique focus on the social factors that increasingly play a role in how drug development is planned, structured, and executed throughout the drug product lifecycle, this is an essential resource for students, professors, and researchers who seek a better understanding of the interface between the pharmaceutical industry, health care systems, and society.